With contrast color detailing throughout, this double-knit jacket is right on trend. 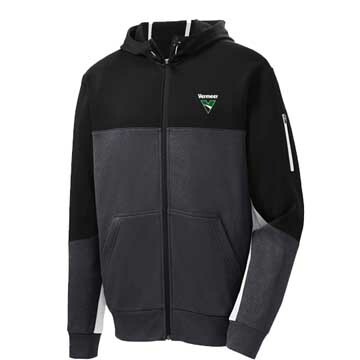 100% polyester full-zip with moisture-wicking performance and fleece inner lining. Three-panel hood with drawcord and toggles, contrast reverse coil zippered media pocket with headphone exit port and loops to hold your headphones at the neck. Rib knit cuffs and hem and front pouch pockets. Embroidered logo.